Prohibitive Horse of the Year favorite Gun Runner had another methodical work on his march to Gulfstream Park's $16 million Pegasus World Cup Invitational (G1), motoring three-quarters of a mile in 1:13 1/5 with his faithful workmate Gettysburg Sunday morning at the Fair Grounds. Starting off a couple of lengths behind his fellow newly-turned 5-year-old, Gun Runner went splits in 12 1/5 seconds, 24 2/5 seconds, 36 2/6 and 49 1/5, going the final quarter-mile in 24 seconds before completing the six furlongs in 1:13 1/5, galloping out seven-eighths of a mile in a strong 1:25 4/5 and the mile in 1:39 4/5. Gun Runner was on Gettysburg's hip through the stretch before striding out in front coming to the wire with minimal encouragement from jockey Florent Geroux. 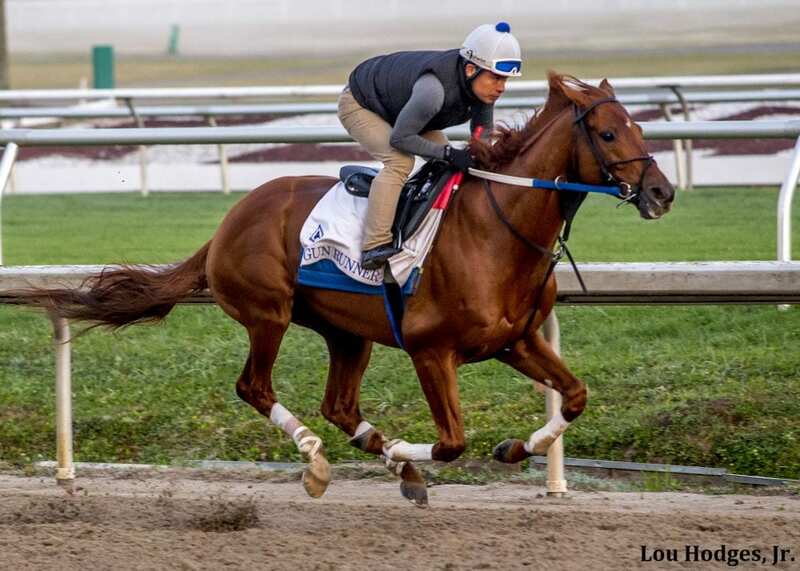 The workout came a week after Gun Runner and Gettysburg powered six furlongs in a race-worthy 1:10 3/5, a more resolute training move in anticipation of below-freezing temperatures in New Orleans. The Breeders' Cup Classic (G1) winner is expected to be asked for more in next Sunday's work, his final at the Fair Grounds before flying out Jan. 18 to Fort Lauderdale and Gulfstream Park. If the Asmussen training pattern holds, Gun Runner will have an easy half-mile at Gulfstream to conclude preparation for his career finale before starting a stallion career at Three Chimneys Farm, the breeding operation near Lexington that owns Gun Runner with Winchell Thoroughbreds. Charles Fipke's Pegasus contender Seeking the Soul, winner of the Clark Handicap (G1) in his last start, had a leisurely five-eighths of a mile work in 1:03 1/5 under Emerson Chavez also Sunday at Fair Grounds. It was the 29th fastest out of 54 at the distance. Trainer Dallas Stewart said he wanted to slow down the work after the 5-year-old went a half-mile in a resolute 48 seconds the week before, the fourth-fastest that day of 94 workouts at the distance. Seeking the Soul will be on the same Jan. 18 Tex Sutton equine charter that brings the California horses to Florida, the flight stopping in New Orleans. This entry was posted in NL Article, Pegasus World Cup and tagged candy ride, charles fipke, dallas stewart, Florent Geroux, gettysburg, gun runner, pegasus world cup, seeking the soul, steve asmussen, unbridled's song by Press Release. Bookmark the permalink.